I’m excited to announce that our chapter — “News Coverage of Cancer Research: Does Disclosure of Scientific Uncertainty Enhance Credibility?” — was published in the 2018 Routledge book Risk and Health Communication in an Evolving Media Environment. The study examines whether certain practices in journalism could be systematically lowering public perceptions of credibility with regard to cancer research reports. Though likely unintentional, this could lead to biased processing and, potentially, dismissal of health information that is important in helping the public avoid health risks. The study was modeled on a prior experiment by Jensen (2008), which found a link between disclosure of scientific uncertainty attributed to the primary scientist, and increased trustworthiness ratings for both the journalist and the primary scientist. This study aimed to see if Jensen’s (2008) earlier findings hold up (a) with updated news credibility measures, (b) in a sample that is more representative of the general public, and (c) in a more current media environment. Additionally, we explored whether source and amount of uncertainty would influence public support for scientific research in general. Consistent with Jensen (2008), the present experiment found that amount and source of uncertainty significantly impacted audience perceptions of journalist credibility. Specifically, participants found the journalist more credible when the story contained a higher amount of uncertainty, but only when it was disclosed by the primary scientist (as opposed to an outside scientist, i.e., a “dueling” frame). The observed effect was small but significant and held across all four different cancer news articles, suggesting the effect occurs systematically and was not due to features of a particular article or cancer topic. The same conditions may affect credibility judgments for scientists, though it was not apparent in the current study. Neither amount nor source of uncertainty had an impact on support for science; that is, people were generally supportive across the board. Most interesting is that the fuller uncertainty disclosure from the primary scientist led to higher credibility ratings for journalists. What we don’t yet know is why this would be the case. Are news consumers getting savvier about how to interpret media reports of scientific research? That’s what I aim to answer with my next study, which will take a mixed methods approach to examining how the public evaluates science news. 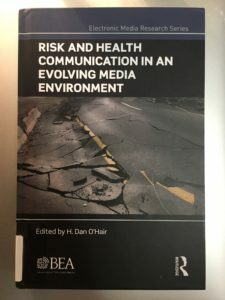 And here’s a recent review of the Routledge volume by Yotam Ophir in the European Journal of Communication. If you’d like a copy of the chapter, please feel free to email me. This entry was posted in Uncategorized and tagged journalism, public understanding of science, science news, scientific uncertainty on September 15, 2018 by Chelsea.